All formalities aside, this bread is A.MA.Z.I.N.G. Crusty on the outside, dense, chewy and I-should-be-sitting-in-Italy-right-now on the inside. It is rustic perfection. Brad and I stood at the kitchen sink and tore through a half loaf minutes after it came out of the oven. Like a pack of wolves came to mind. Except not. 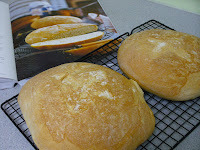 I was forced to deviate from "The Bread Bible" with this recipe: Unfortunately, I didn't have the ceramic tiles to line the top and bottom of my oven that "Bible's" Tuscan bread recipe called for. Go figure. Therefore, I resorted to my new Favorite Cookbook of All Time -- "The Food of Italy: A Journey for Food Lovers." Some things just have a way of working out. This recipe calls for making a starter -- yeast, honey and milk -- that sits overnight transforming itself into a sticky fragrant pile of, well, yeast goo. I had to toss out my first attempt because the recipe said to IF the yeast, honey and milk didn't bubble in 5 minutes. Of course, they didn't, so down the drain it went. Picky, picky, picky. But the second round did fine and, after percolating for 24 hours, it was ready to go. 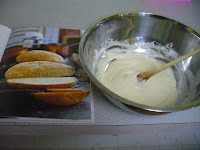 Much to my delight, you mix the flour into the starter, plus some warm water and MORE YEAST, with your hands. There's nothing more fun being up to your wrists in warm, sticky bread dough that feels like it won't come ever come off. Both risings were uneventful, except with that extra shot of yeast, my laundry room took on the delightful scent of stale-beer-frat-house-meets-fabric-softener. I felt like I was in college again. And the result, after baking for 30-35 minutes -- simple, rustic perfection. I think there may be a couple more loaves in my future.